This continuation of Pete Dr. 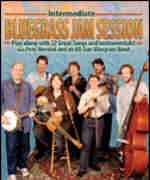 Banjo Wernick's popular series features a professional bluegrass band providing back-up to favorite jam session songs. Beginning to intermediate players will get the practice they need to join in the fun. For early intermediate level players. 2 hours. The Banjo Primer Jam CDs play rhythm to all of the songs in the Banjo Primer at 5 different speeds. This companion product to the Banjo Primer is the perfect way to increase your playing speed, improve your timing and make that critical leap between practice and actually jamming with friends.